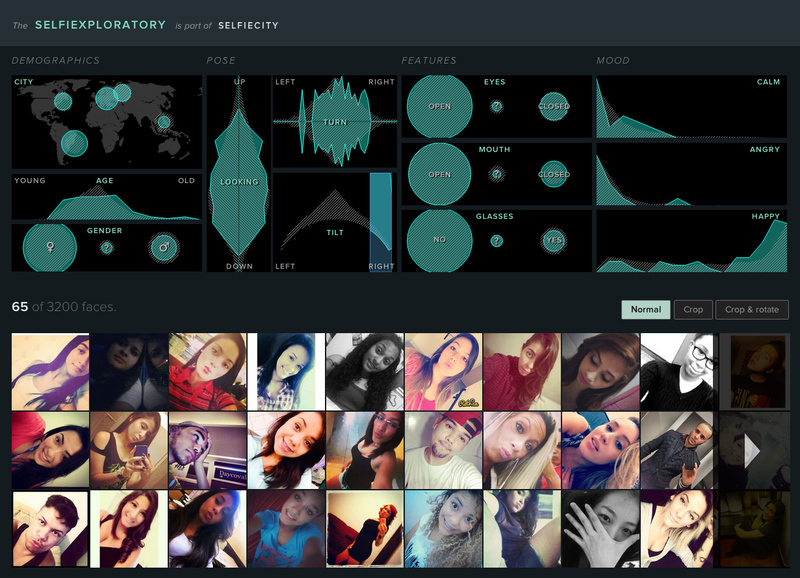 Investigating the style of self-portraits (selfies) in five cities across the world. 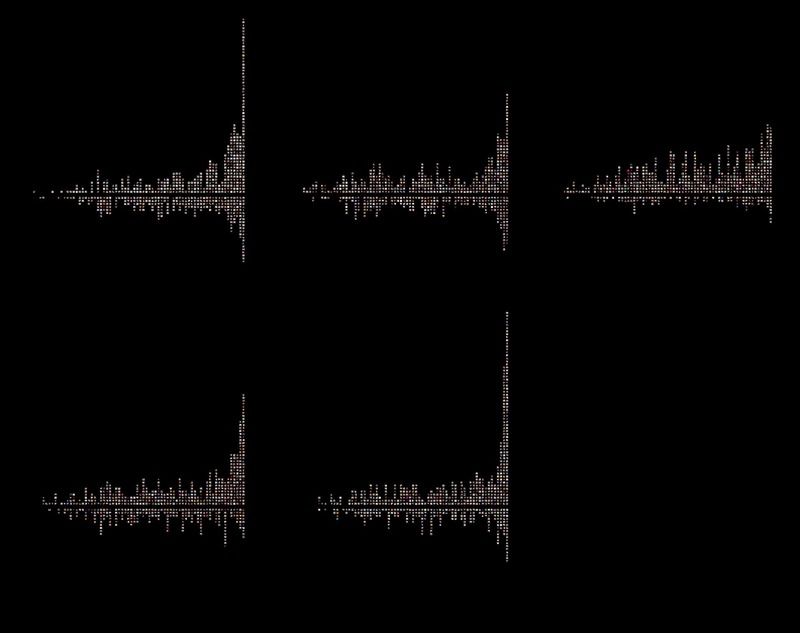 In these grids, we have arranged the photos horizontally by head tilt; the vertical axis shows you if people look up or down. Case by case inspection of photos can reveal a lot of detail, but it is difficult to quantify the patterns observed. "Is it just me, or do Sao Paulo women actually tilt their heads more? Do New Yorkers or Berliners look older?" We can also the determine the facial expressions of the selfies in a city — who smiles the most, and who has more reserved looks? Experiment with all the data we collected. 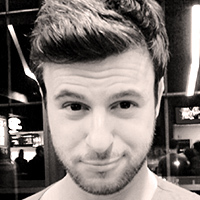 Do angry people tilt their heads more strongly? And what is a characteristic mood for people in Moscow? Find out! This project is based on a unique dataset we compiled by analysing tens of thousands of images from each city, both through automatic image analysis and human judgement. 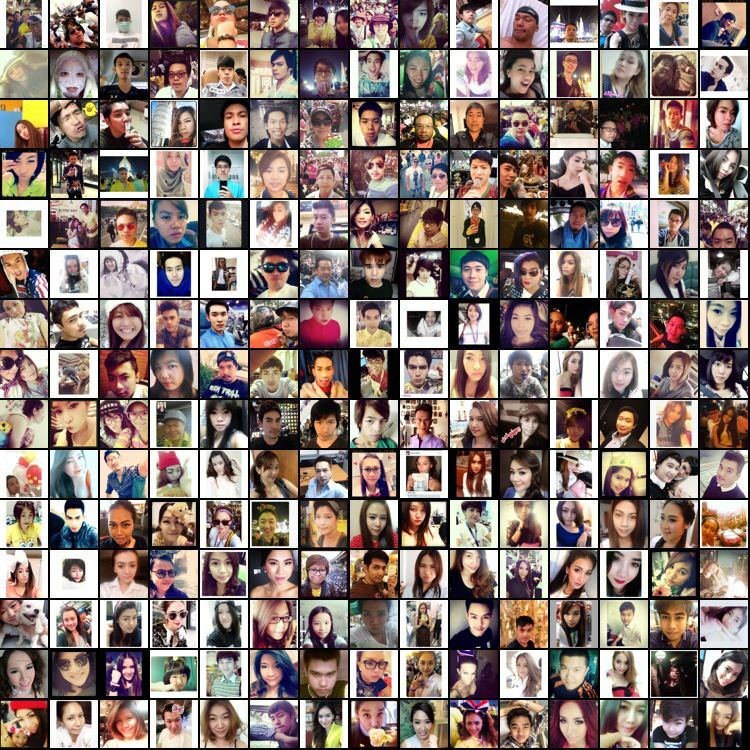 To locate selfies photos, we randomly selected 120,000 photos (20,000-30,000 photos per city) from a total of 656'000 images we collected on Instagram. 2-4 Amazon’s Mechanical Turk workers tagged each photo. For these, we asked Mechanical Turk workers the simple question "Does this photo shows a single selfie"? We then selected top 1000 photos for each city (i.e., photos which at least 2 workers tagged as a single person selfie). We submitted these photos to Mechanical Turk again, asking three "master workers" (i.e. more skilled workers) not only to verify that a photo shows a single selfie, but also to guess the age and gender of the person. On the resulting set of selfie images, we ran automatic face analysis, supplying us with algorithmic estimations of eye, nose and mouth positions, the degrees of different emotional expressions, etc. As the final step, one or two members of the project team examined all these photos manually. While most photos were tagged correctly, we found some mistakes. We wanted to keep the data size the same (to make visualizations comparable), so our final set contains 640 selfie photos for every city. 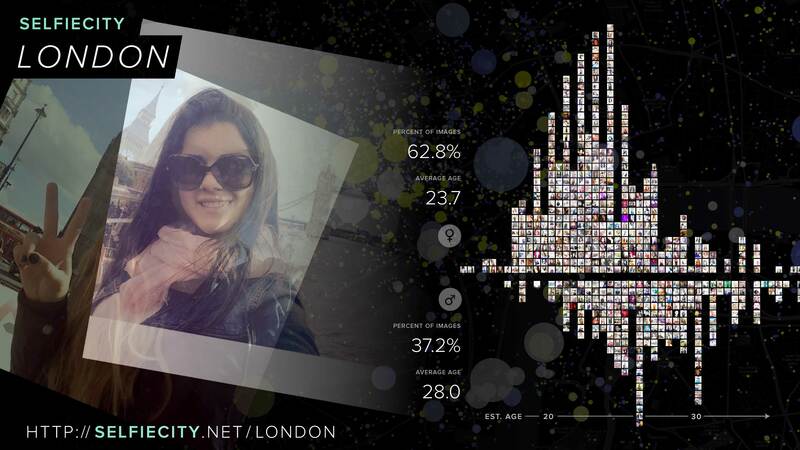 Depending on the city, only 3-5% of images we analysed were actually selfies. 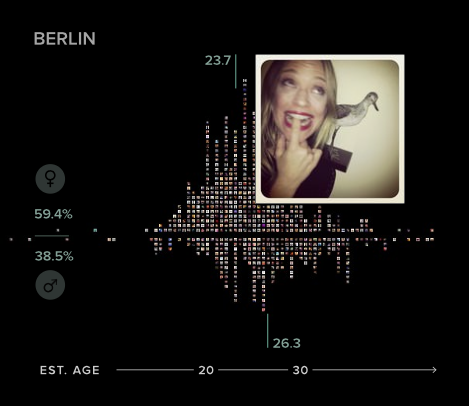 In every city we analyzed, there are significantly more women selfies than men selfies (from 1.3 times as many in Bangkok to 1.9 times more in Berlin). 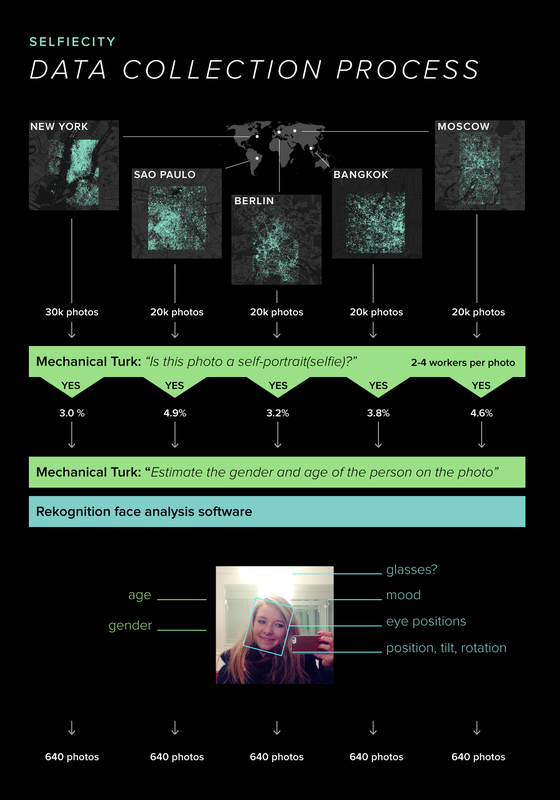 Moscow is a strong outlier - here, we have 4.6 times more female than male selfies! A young people's sport? Indeed. Most people in our photos are pretty young (23.7 estimated median age). Bangkok is the youngest city (21.0), whereas NYC is the oldest (25.3). Men's average age is higher than that of women in every city. Surprisingly, more older men (30-) post selfies on Instagram than women. Our mood analysis revealed that you can find lots of smiling faces in Bangkok (0.68 average smile score) and Sao Paulo (0.64). People taking selfies in Moscow smile the least (only 0.53 on the smile score scale). Women's selfies show more expressive poses; for instance, the average amount of head tilt is 50% higher than for men: (12.3° vs. 8.2°). Sao Paulo is most extreme - there, the average head tilt for females is 16.9°! How can history of photography help to better understand selfies phenomena? How can we approach theoretically social media images in general? This essay reviews some of the most recent debates on the selfie phenomenon and places it into a broader context of photographic self-portraiture, investigating how the Instagrammed selfie differs from its precursors. 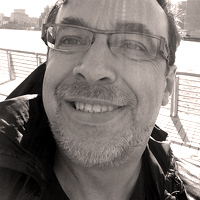 The Selfie phenomenon should be viewed in the light of history of photography as a sub-genre of self-portraiture and as a new subject of vernacular photography studies as well as treated as a side product of technological developments that have led to the easy availability of image-making devices and image-sharing platforms. Writing about media interface presentations and their relation to larger cultural trends is tricky. Different elements are constantly added, changed or removed, new services are frequently developed and released to public use, and new technologies capture the imaginations of many. Within this flux, what can we say about social photography in particular and contemporary image productions in general, that is not confined to the characteristics of one platform or another? Can we identify overarching processes that cross platforms and are destined to change the way we interact with images? As large-scale media visualizations from the Selfiecity database of images shot in five cities on four continents indicate, the selfie has become a truly transnational genre that is as much about placemaking as it is about the narrowcasting of particular faces and bodies. 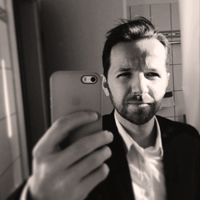 At the same time, the scholarly literature around this specific form of self-representation through closely distant mobile photography has struggled to keep up with theorizing emergent new media practices that utilize lenses, screens, mirrors, and armatures in novel ways and generate compositions with distinctive framing and posing that mark belonging to selfie taxonomies. 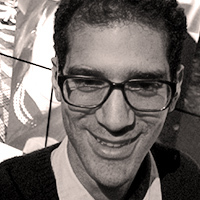 Expert on digital art and culture; Professor of Computer Science, The Graduate Center, CUNY; Director, Software Studies Initiative. 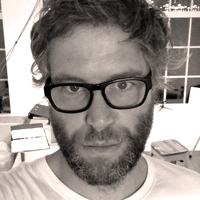 Independent consultant in information visualization / Truth and Beauty Operator. M.A. in Interface Design, B.Sc. in Cognitive Science. Researcher Scientist, Software Studies Initiative; Ph.D. in Computational Neuroscience, UCSD. 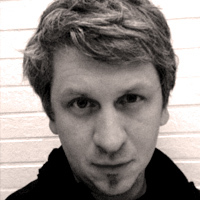 Data visualization and mobile interaction designer, Ph.D. in Media Informatics from the University of Munich. Freelance Consultant; exploring the cultural impacts of ubiquitous access to information to create new products and services. M.A. Royal College of Art. 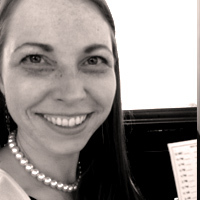 Art historian and curator; co-curated the Latvian Pavilion at the 55th Venice Biennale in 2013; Ph.D. student, The Graduate Center, City University of New York. 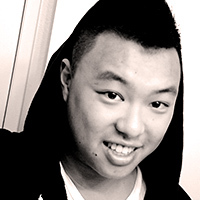 Researcher, Software Studies Initiative; Web and Mobile Developer at Motive Interactive. 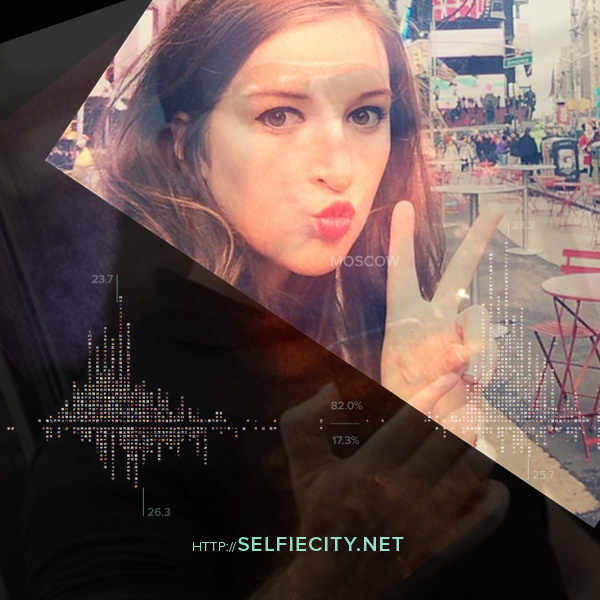 The development of selfiecity was supported by The Graduate Center, City University of New York, California Institute for Telecommunication and Information, and The Andrew W. Mellon Foundation. And big thanks to gnip for the support with the data collection! 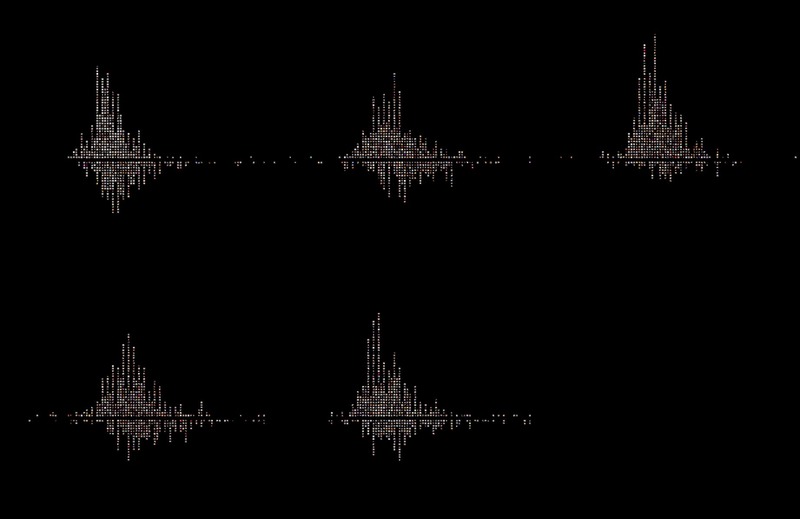 New: Check out Selfiecity London, our adaptation of the project for the Big Bang Data exhibition, Somerset House, London.